Perfect peace and feast of flavor. 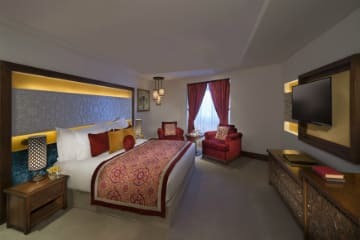 Find your oasis this Holy Month at Souq Waqif Boutique Hotels. Retreat to the calm of your room or suite, celebrating the meeting point of Arabian heritage and contemporary style. Perfect peace. Feast of flavors and a flexible stay. Accommodation with Suhoor and Iftar. The rates quoted are net per room per night, subject to seasonal variations and change without notice. Rates noted above are based on recent currency exchange data. The rate indicated on your confirmation is in the official hotel currency and will be charged at that rate at check-out. Subject to availability, a cancellation policy and children policy. Restricted availability during high demand periods and public holidays. The above benefits may not be used in conjunction with any other discount, or exchanged for any other service or cash.